It is quite challenging to manage your team through change. Change can be a bit confusing and scary but it is unavoidable in life and work. The change can be a minor one or a complicated one. Good leaders are able to embrace change and know to lead their team members well. Leading through change is something that needs to be learned by team lead in real life and not taught in business school. 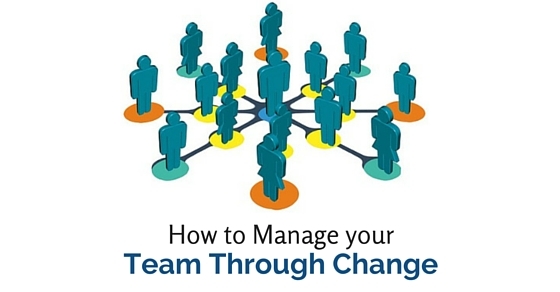 In that manner let’s run through a few hints about how to manage your team through change. The following mentioned are few tips on how to manage people implementing change and leading a team. Change is required in every business in order to survive in the present scenario. A company would collapse if it is not able to react and make changes. It is also mandatory that changes are to be made not just for sake of making it. More over formulating a plan can be a best idea before any transformation is made. Pick out arenas in business that needs a plan prior execution. When there is a change the end goal and objectives should be something that should be kept in mind. It is important to think where the company stands today and where it needs to be in some days. The leader should possess the capability and confidence to change, though he finds another track with more vision and sense. It is a good idea to listen to employees and be bold enough to adjust direction and move in when another opportunity pops in. When corporate changes evolve, communication is the only king which is mandatory. It can be tough for the leader to have all the members behind him from the initial day. The leader should make sure that the members of the team are updated with developments and aware of goals. Likewise communication should be open and the members should be aware of the change process so that employees get on board. The members should also be offered the opportunity to share ideas, give suggestions and comment throughout the period of change. During transformation in a workplace, there are people who behave in a varied manner, in that aspect the potential saboteurs and change advocates should be picked out by the leader. It would be a good suggestion to take up the key players and let them travel the changed phase. When new process pops in, these team members are key players and they assist the skeptics to take part in the work and maintain the team spirit. Leading teams is a very important qualification for any team lead. A change cannot be executed just by an individual team leader. The leader should make sure to delegate tasks to team members and assign deadlines. It is also equally necessary to be with the employee and provide him all required. During the period of change make sure to answer the queries of the employee and also provide him with guidance. By delegating responsibilities more people are encouraged to take up owner ship. When there is a failure, the leader should not set up himself or the department for the same. At times when changes occur, the team members should be able to assign time and put in more effort and set realistic goals. It is never good to set too high expectations, which leads to compromise in quality and meeting deadline are failed. In that manner team spirit is dropped and people become isolated which leads to a unhappy work force. A business leader’s value can be measured by monitoring and analyzing his ability to manage expectations. It is often critical and tough to manage expectations when a department is in change. Make a clear list of what the employees expect from the leader and what the leader expect from them. To implement a change, hold the employees accountable. For the same to be accomplished provide them with tools, resources, talent, responsibility and authority for completing the race. Any category of change that happens in an organisation is sure to invite low morale, fear and uncertainty. During such a change the best thing the leader can do is to discuss the change openly with the members. The initial requirement to manage a change in your team is to be positive in mind and also preach the same to the team members. The essential quality for a leader when the team is muddled with change is to give direction. This suggestion can be apparent and cannot be accomplished as mentioned. There are times where some people think that they are providing the right direction and end up with assumption. The two main important parameters for a team in change is communication and repetition. By this way, all the team members will know their plan and also play their specific roles in the right manner. A team would feel scary when there are changes that take place and when they are unclear about changes being made. It is a fact that all good companies should accept the change as they are growing. Change can be an issue but it is the responsibility of the leader to educate the members that change is positive necessity for the organization. During this period the team needs to guard themselves from external threats and have a focused confident attitude by which the team will stay concentrated about their responsibilities. When changes occur in an organisation there are certain aspects which need to be restored. Few of them are auditing of existing systems, responsibilities, roles and more. By this way the complete organization is rebuilt where job description, elimination of overlap, consolidation, and developing enhanced efficiencies are redefined. With all the aspects a perfect and profitable business can be run. While managing a team through change, there are positive conflicts that arise and are imperative. Averting conflicts or showing a passive aggressive behavior can result in delayed result or perniciousness. Conflicts should be addressed as they arrive. It is advisable to challenge the existing process, and chaos in the company is also known to be inevitable. When the company is under change there are certain aspects that the company should stop doing and also a certain aspect that the company need to do. The leaders should be aware and make sure that the norms are followed and the company keeps moving in the right direction keeping in mind the overall vision. When an organisational transformation is undergoing, make sure to think before you act. The leaders should be sure about the change that is happening in the organization and ones that are going to make a change. The organizational change process is external and most likely to be successful. At times of the process of change in an organisation, the leader should have understood the employee’s needs, capabilities, personalities and skills. This can be helpful in managing change in organizations that has taken place. The leader should therefore be in a position to understand the team members to handle change. To manage change in a team, the leader should be an example so that the members also adapt change. The leader should be open and receptive to the upcoming change. The leader should be flexible, resilient, and adaptable without blocking the team’s effect. This predicts that the leader will promote the team and also take up failures of occurs. Another aspect to focus on and manage the team at times of change is that, input from members can be obtained regarding strategic leadership goals and direction. The leader should be enthusiastic so as the members will. In the same manner the members should be engaged in decision making process. By this way the members are made valued and their ideas are contributed to the work. By this way the employees can be encouraged and change can be handled without chaos. When there is a situation to manage the team at time of change, great leaders do not do it by them. They make sure that all team members participate and work together in a united manner. Your organisation can be turned into a new business as usual when leaders manage change effectively and many people are ready to accept the change. When they are going through changes there is minimum disruption and also projects keep going rather than failing. These are a few hints which can be followed in order to manage team through change. There are many sites which offer complete solution for the same topic which can be read through. Changes are necessary for any organisation and handling change with the team is vital.